Parry returns for his second season with the Ducks and ninth in professional baseball. The southpaw was a strikeout machine in his first season with the Flock. The left-hander struck out 116 batters over 14 starts in 2018, a total that ranked second among all Atlantic League pitchers. He trailed only York’s Mitch Atkins (137) despite having made 11 less starts than Atkins (25). Parry struck out 10 or more batters on six separate occasions while averaging 12.3 strikeouts per nine innings and 8.3 strikeouts per start. 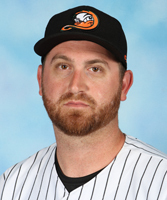 His 14-strikeout performance on May 30 at Sugar Land tied the franchise’s single-game strikeouts record, achieved on three other occasions (Tim Melville, 6/7/17 at New Britain; Rich Hill, 8/9/15 vs. Camden; Mike Loree, September 15, 2011 at Southern Maryland).